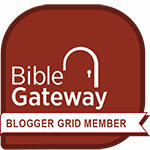 All scripture quotations and references in this blog appear in the English Standard Version (archived posts contain scriptures linked to ESVBIble.org, current and future posts link to Bible Gateway). Why I Blog ESV explains my preference for this version, though it’s certainly not the only Bible I read. The ESV is an “essentially literal” translation that seeks as far as possible to capture the precise wording of the original text and the personal style of each Bible writer. It seeks to be transparent to the original text, letting the reader see as directly as possible the structure and meaning of the original. Read more about the translators and their process. It’s Gary Roberts again. Thanks for your encouragement I smile every time I run across you comment on my new blog. I’m reading through the ESV for the first time this year. I like what I see so far. Thanks for the info on your site.